Some years ago, I made a paper doll of Frank Merriwell, a character from a late 19th century nickel weekly called Tip Top Weekly. It was a lark: I liked the idea more than I liked the character. Frank himself was insufferably righteous and his stories were invariably pretty standard fare. Though he was incredibly popular at the time and survived into the radio days, I was pretty much done with him after reading half a dozen adventures. The appeal for the paper doll was mostly that he was playing some new sport every week, so always had a new uniform which was kind of fun. Frank notwithstanding, I have had a long love affair with nickel weeklies. These trashy things predate comic books and though they were a moral bore now and then, some were quite gruesome. There was no “code” so often you had characters meeting all sorts of murderers and opium addicts. Painted ladies were mostly out, though–that remained a taboo. Last year, while I was taking some time out in the Pacific Northwest, I dug up my copies of Young Klondike. For sheer appeal, this was one of the more interesting of the weeklies for me. It didn’t have the steampunk travel-around-the-world fantasy of Frank Reade’s Library or the crime-solving hard boiled noir of Nick Carter, but it had something far more attractive: snow! For me, an adventure in Alaska was way more exotic and exciting than gumshoes and robots. 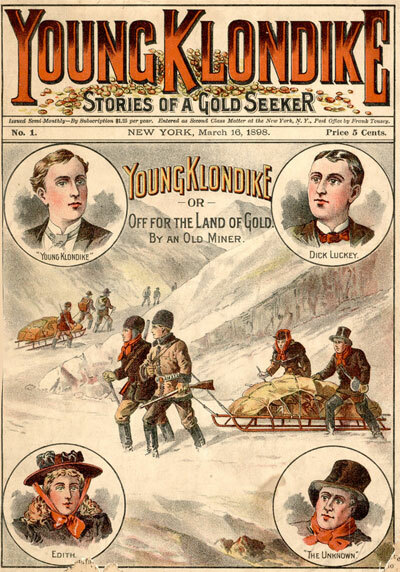 Young Klondike ran for 39 issues, 27 of which are available online. I haven’t read them all because they’re obviously a finite resource. So I like to savor them–as much as one can savor what amounts to pulp trash. Objectively they aren’t great, but I started thinking about re-purposing the text. 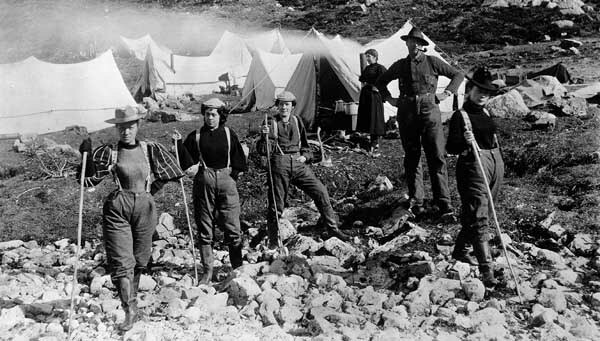 If Young Klondike were written today, what might it look like? Last summer I took the text and began appropriating it into something new. I kept the basic plot and left its quirkiest character untouched for the most part. But I re-imagined the other three central characters for a modern audience. Three hundred pages later, I might have something that could be a book, but that’s not the point. I’m telling you this because I idly started sketching paper dolls for the characters and I thought to myself: this is so completely random. But then, really, all my paper dolls always are. I don’t know what the appeal is for half the stuff I make. But I make things for my own amusement and if they amuse others, three cheers! I just know there are lots of paper dolls for fashion models or popular personalities/characters. I enjoy those as much as anybody (and I make them too!). But I’m also probably that one person who, if I saw a paper doll book of Klondike explorers from 1898, would go completely nuts for it. So, like it or not, you’re probably getting 19th century Klondiker paper dolls in the coming months. It’s just the way this blog rolls. To be fair, I warned you from the start about my esoteric tastes ~ ha!